The 2010 Grammy ceremonies will have one less award to give out with the decision to drop the Polka category from the official Best Album listing, the stated reason being that the awards need to remain "pertinent within the current musical landscape." No matter that the musical landscapes in places like Chicago, Pittsburgh, Cleveland and Buffalo are still filled with the happy sound of Polka music or that bands like Brave Combo and Headless Household have been creatively redefining and expanding the genre during the past several decades. 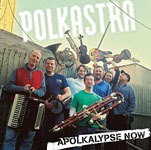 In a similar vein comes Polkastra with their cleverly put together and musically superb Apolkalypse Now. This is not your grandmother's polka music and although she will know tunes like the "Clarinet Polka," she will hear them played by an instrumental aggregation that includes contrabassoonist Mark Timmerman and Australian didgeridoo master William Barton. Violinist Lara St. John and trumpeter Daniel Lapp are the pair of Canadians who front this band and they, along with the rest of their band mates that include French hornist Andy Doe, bassist Jack Campbell and percussionist Yuval Edoot, are excellent musicians who produce some captivating voicings in the context of tight arrangements from Matt Van Brink. St. John impresses most and her fiddle can not only polka but also play bluegrass, classical and jazz. 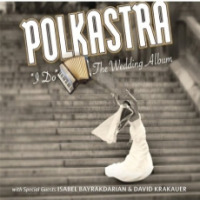 The band's musicianship shines through as other musics are skillfully woven through these arrangements: Beethoven into the classically-inspired "Ludwig Van Polka"; a Roumanian "Sirba" beautifully presented by Edoot on vibes; the countrified "Knife, Fork and Spoon" and a touching interpretation of the Jewish "Araber Tanz" on didgeridoo. If there was a Grammy this year, be assured that Apolkalypse Now would be challenging for the top Polka spot. Personnel: Daniel Lapp: trumpet, fiddle, guitar, vocals; Lara St. John: violin; Andy Doe: French horn; Ronn Yedidia: accordion; Mark Timmerman: contrabassoon, bassoon; Jack Campbell: electric bass; Yuval Edoot: percussion, vibraphone; William Barton: didgeridoo.